WANTED: A 90-minute period to breathe new life into a flagging season. And Andy Barcham sees Hartlepool as the opportunity to finally provide the crucial winning kick-start. It has now been nine matches without a victory for Andy Awford’s side as their League Two play-off ambitions have been transformed into a relegation struggle. 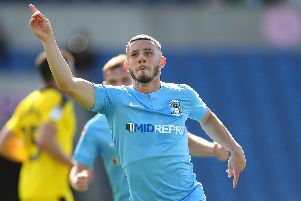 Hope, however, was handed out at Wycombe last weekend when the Blues conjured up a highly-encouraging performance against the then-league leaders. The goalless draw did not accurately reflect Pompey’s impressive showing, particularly in the first half, yet a point represented progress. Tomorrow Awford’s side entertain Hartlepool – the division’s bottom club who last weekend beat Plymouth 3-2. And with their last five fixtures against the top six now out of the way, Barcham is seeking the spark to ignite Pompey’s recovery. The winger said: ‘We have felt the performances over the last five games were there but the results are what are important, we need to climb the table. ‘Looking at Wycombe, we took a lot of heart and positives from that performance. It’s a shame we couldn’t get a win and get that run of consistency and winning mentality going – that’s what you need. ‘If you can get one win the others will come. You start getting a little run together and then you can climb up the table very quickly. ‘I have done it myself in the past with previous teams. As soon as you get one, you go on a little run and the league is so tight you can start to progress. ‘We have a lot of home games coming up, with some Tuesday games also this month, and if you can get a little run going of Saturday, Tuesday, Saturday, Tuesday, we can move up the table quite quickly. ‘Ultimately, it’s a results business and we’re not getting the results we need. ‘Hopefully, we can get that first win tomorrow and then kick on from there. The Blues have collected three points from their recent tricky five-match period, yet crucially no wins. Still, February throws up a different standard of opposition, with plenty more winnable fixtures if the league standings are taken into account. Following the Pools’ visit, there is a trip to 19th-placed Dagenham & Redbridge on Tuesday night. Pompey’s improved form of late has been recognised in Awford’s vote of confidence from the board of directors recently. And Barcham believes hard work on the training ground is beginning to pay off. He added: ‘I thought I did okay against Southend but didn’t get the result we wanted. ‘It’s frustrating, we’ve been working hard on the training ground, working on closing the opposition down and playing how we want to play and I think we have been doing that. That has been evident in how we are currently playing.